A collection of statement neckpieces designed and made exclusively for this show by some of Scotlands most exciting and innovative makers. 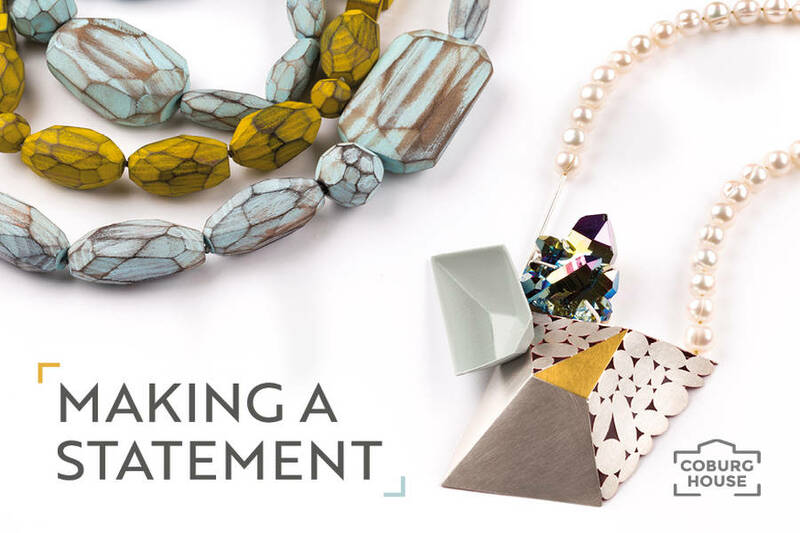 Making a Statement is an exhibition taking place at Coburg House showcasing a collection of statement neckpieces designed and made exclusively for this show by some of Scotlands most exciting and innovative makers. Featuring a range of materials including ceramic, resin, wood, rubber, precious metals and stones. Curated by contemporary jewellers Donna Barry and Kaz Robertson. Donna and Kaz graduated from Edinburgh College of Art in 2002 and have shared a studio within Coburg House Studios since. This is their first joint curated exhibition. The exhibition opens on Thursday 3rd May, 6-8pm with a Meet the Makers Event. If you can’t make the opening event the show will be open every Saturday and Sunday from the 5th-20th May 11-4pm. Feel free to contact Donna or Kaz on donnabarry79@hotmail.com or kaz_m_r@hotmail.com if you need any further information on the ‘Making A Statement’ show.